Crystal Palace manager Alan Pardew has confirmed he is interested in signing former Tottenham forward Emmanuel Adebayor. The 31-year-old is a free agent since leaving White Hart Lane in September. Palace are the lowest scorers in the top half of the Premier League with 22 goals and Pardew is looking for attacking reinforcements. "We've had discussions about him and he is in that kind of nine or 10 strikers that possibly we could get," he said. 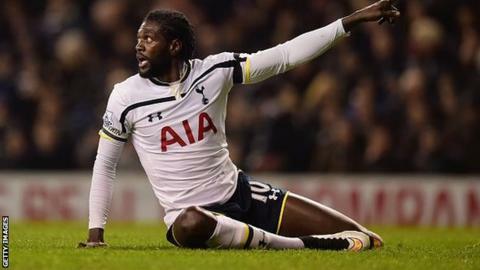 "It's a tough call for anyone who takes Adebayor - how much game time has he had? That is a question mark." Pardew made a failed attempt to sign the Togo international in 2006 when he was in charge at West Ham. Adebayor instead joined Arsenal from French league club Monaco. He went on to play for Manchester City and a loan spell at Real Madrid before joining Spurs in 2012. Questions have been raised about Adebayor's attitude and commitment, but Pardew added: "Whenever he has played against me he has been totally committed and he's a dangerous world player. "I have had difficult players before, none more difficult than [Hatem] Ben Arfa [at Newcastle]. If I can deal with him, I can deal with Adebayor for sure. "You have only got to look at his clubs and of course, for whatever reason there has been a fall-out at Spurs, but he remains a player that can have a great impact. He's one of those players that would improve us." Will Adebayor be a good signing for Palace? On BBC Radio 5 live's weekend preview show, the guests discussed whether Palace should sign the striker. The Daily Telegraph's Jason Burt revealed the club would need to negotiate with Spurs, who still pay him £100,000 a week. Former Leicester boss Nigel Pearson said: "He's a really good player. He'd put bums on seats. I think Alan Pardew is very capable of managing high-maintenance players. If he does decide to go for it, it won't be on a whim." Stoke midfielder Charlie Adam added: "He'll take the load off Connor Wickham. I think he'd be a good signing." For all the latest transfers check out our transfer deals page and for all the manager ins and outs, see the our list of current bosses.